Bruxism also known as teeth grinding, is one of the many health conditions that most sufferers are unaware of. It usually occurs during sleep and unless a sore jaw and other oral complications arise, most people never realize that they suffer from teeth grinding. Teeth grinding is normal at some point, especially if the frequency is quite low. However, it becomes a problem if it occurs more frequently. Teeth grinding can lead to other health problems like wearing down of teeth, tooth loss and even jaw damages leading to hearing loss. This is why preventing teeth grinding and minimizing its occurrence is of utmost importance. Here are some simple ways for you to prevent it. The most visible and probably the most common preventive measure for teeth grinding is a mouth guard. 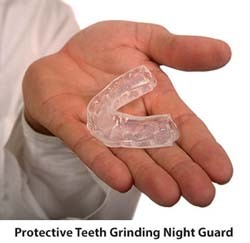 A mouth guard can help protect your teeth should you be grinding your teeth at night. You can ask your dentist to make one especially for you. Make sure to wear it everytime you sleep otherwise all efforts will go to waste. There are numerous cases of teeth grinding where the cause is stress. 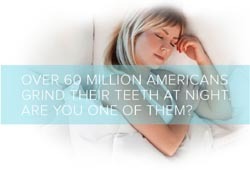 When people get stressed, they have a higher tendency to grind their teeth during sleep at night. Try to limit occasions of being stressed by taking a warm bath before bed or try to talk out your problems with friends and family. If you are currently suffering from jaw pains and discomfort, try to avoid consuming food that entails a lot of chewing. This will give your jaw some time to relax. More importantly, consult a dentist immediately. Do you have Tooth Grinding Problem? You will never know if you have bruxism or tooth grinding unless you ask your wife or other people you in bed with. That is when you unconsciously grind your teeth in sleep as if you have you have an invisible food in your mouth. Do you have tooth grinding? Experts would say that it’s more like “chewing your problems” since it is stress related. Interestingly, those people who have not dealt with their problems in life lightly or may have over stressed themselves will end up grinding their teeth at night. Much to the disturbance of their sleep mates, tooth grinding will cause a great deal of damage to the teeth which will end up to toothache. What to do? Try to put stress to sleep. That’s right. Before going to bed, avoid doing anything stressful for at least half an hour. You may listen to soft music or take a warm bath and forget about the stress of the day. Some herbs like chamomile, valerian and skullcap are believed to relieve anxiety and provide deeper sleep. Take a tincture of any of these herbs before bedtime stirring the dose as recommended on the label. And here’s an interesting technique. If you knew you were tooth grinding you would not do it right? So, the right thing to do is biofeedback. Help yourself become aware of what your doing, this time by doing it consciously and with a little bit of pain. Put your tongue in between your upper and lower teeth and try to clench your teeth. It will hurt a bit of course then tell yourself “I don’t have to do this!”. This technique has been found to be very effective. Try it and see for yourself.